Most of the time, AirPods works flawlessly with the iPhone and iPad. It feels like it was designed primarily to work with the iPhone and other Apple devices like MacBooks were an afterthought. Because there’s no quick and easy way to connect or disconnect AirPods with Mac like there is with iPhone. The process is a lot less seamless. And often AirPods will just refuse to speak to Mac. 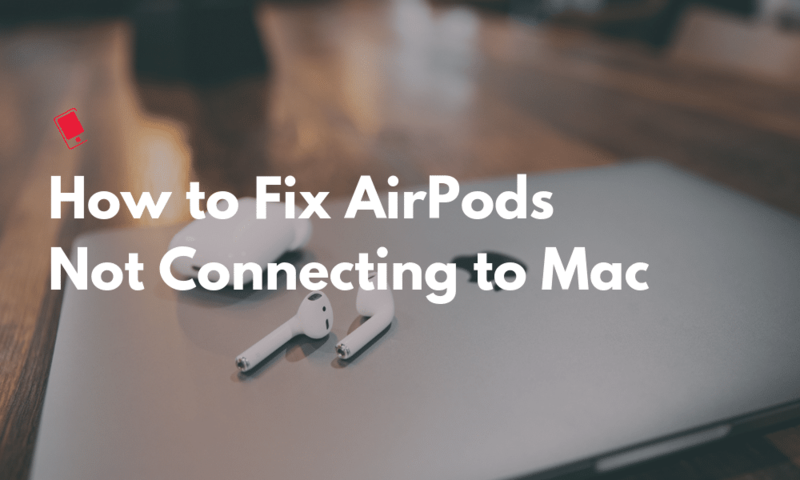 Here’s how you can fix AirPods not connecting to Mac. If you’ve set up your AirPods with your iPhone, they should show up automatically on your Mac as long as all your devices are on the same iCloud account. But often, that just doesn’t work. If you’re not able to automatically or manually connect AirPods to your Mac, follow the methods below. If your AirPods are on your iCloud account, they’ll show up automatically in the Bluetooth section. Click on the Bluetooth option from the menu bar, click on your AirPods and click on the Connect button. When you do this, make sure your AirPods are charged up and the AirPods case is open (or that AirPods are in your ears). After a while, your AirPods should connect to the Mac and you’ll see their battery percentage there. If you want to disconnect, just click on the Disconnect button. If your AirPods are already paired with your Mac but they refuse to connect, you’ll have to unpair and pair them again. As AirPods work as Bluetooth headphones, this is the same as resetting them. Step 1: Open the System Preferences app and go to Bluetooth. Step 2: You’ll see your AirPods in the list if they’re already paired once. Right-click and choose Remove. On the next pop up, click on Forget Device. Step 3: Your AirPods are now disconnected and reset. Open the AirPods case next to the Mac and press and hold the Round setup button at the back of the case. You’ll see AirPods in the list of available devices. Click on the Connect button to start the pairing process. In a couple of seconds, they’ll be connected and you’ll see them in the Bluetooth section in the menu bar as well. As we’ve highlighted in our AirPods tips and tricks guide, you can manually reset your AirPods without involving the Mac. Just press and hold the Round button at the back of the case for 10 seconds or until you see the white flashing light inside the case. Now when you go to connect it to the Mac, you’ll have to go through the pairing process again. Once you’re done, the issue of AirPods not connecting to Mac should be fixed. Constantly manually connecting to AirPods on the Mac is very frustrating. Especially when you have to go to the Bluetooth menu to connect to AirPods. AirBuddy is a small $5 utility that solves this problem. It brings iOS style connection popup to the Mac. Just flick open the AirPods next to your Mac and a panel will drop down listing your AirPods and their battery percentage. Just click on Click to Connect button and your AirPods will be connected. The best thing about AirBuddy is that it works consistently, every time. This is the feature Apple should have included in macOS. If AirPods are connected but there’s no sound coming from them, you should check to see if they’re selected as output or not. You can do this by clicking the Volume icon in the menu bar and then selecting your AirPods. Alternatively, you can go to the Sound section in System Preferences and select your AirPods as an output. If you’ve done all of the above and AirPods are still not connecting, try to connect them to your iPhone or iPad and see if they’re working there. If it’s not the AirPods, it might be your Mac’s problem. In that case, first, try rebooting your Mac. Power it down and boot it again after leaving it powered off for a minute. If the issue still isn’t solved, click on the Apple button from the menu bar and click on About This Mac. See which version of macOS you’re using. If it’s a couple of years old, the first thing you should do is click on the Software Update button and update your Mac to the latest version. Do You Use AirPods With Your Mac Often? Do you only carry your AirPods with you when you travel and you use it with both iPhone and Mac? Or do you prefer to use better-sounding headphones with the Mac? Share with us in the comments below.